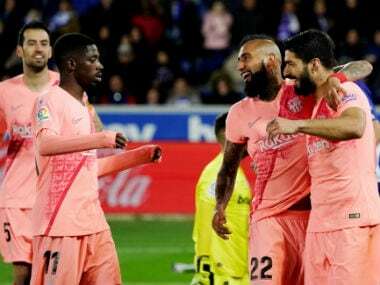 Madrid: Valencia maintained their pursuit of Barcelona to remain four points off the La Liga leaders thanks to second-half goals from Geoffrey Kondogbia and Santi Mina to beat a luckless Espanyol 2-0 on Sunday. A club record eighth straight La Liga win for Valencia moves Marcelino Garcia Toral's men six points clear of Real Madrid in third and sets up a mouthwatering top of the table showdown at home to Barcelona next Sunday. 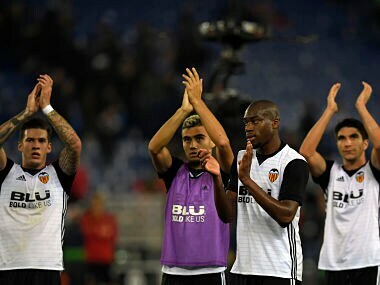 "We want to beat Barcelona to be as high in the table as we can, but we still can't talk about being candidates to win the title yet," insisted Valencia assistant coach Ruben Uria, who faced the media after Marcelino was sent to the stands in the second half. However, the visitors had fortune on their side as Espanyol dominated for large spells and hit the woodwork twice. "In the first half they got the better of us, but the team knew how to resist, stay compact, suffer and compete," Mina told BeIN Sports Spain. 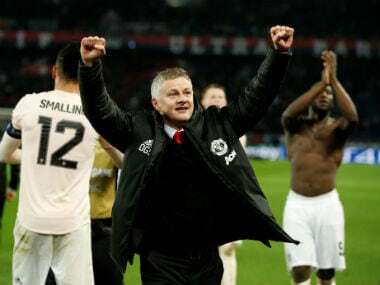 "The big teams also win like this. The important thing was to win." 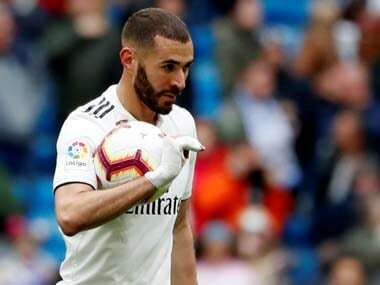 Marcelino surprisingly left top scorer Simone Zaza and on-loan Paris Saint-Germain forward Goncalo Guedes on the bench and that decision nearly backfired as Valencia struggled to gain a foothold in the first hour. Gerard Moreno and Sergi Darder both struck the post for the hosts in a six-minute spell just before half-time. Valencia's goalkeeper Neto also had to show smart reactions to deny Sergio Garcia and Moreno once more as Espanyol looked the more likely side to make the breakthrough. The pressure Valencia were under was seen on the sidelines as Marcelino was sent to the stands for his protests towards the officials and is now likely to be banned from the touchline against Barca. However, a moment of magic from Kondogbia swung the game Valencia's way 23 minutes from time as he curled home a wonderful strike from 25 yards. And Mina pounced on Victor Sanchez's short back-pass to calmly side-foot past Pau Lopez on the volley to secure all three points. At the other end of the table, Malaga came from behind to edge a five-goal thriller against Deportivo la Coruna 3-2 to move off the bottom of the table. Borja Baston's first goal for the club six minutes from time saw Malaga leapfrog Las Palmas and Alaves to close within a point of safety. Las Palmas remain rock bottom as coach Paco Ayestaran stretched his La Liga record losing streak to 13 games in a 2-0 defeat at home to Levante. The Canary Islanders were made to pay for missing a host of chances before being hit by Levante's sucker punch as Cheick Doukoure and Jason struck in the final 20 minutes. Athletic Bilbao snapped their three-game losing streak thanks to a characteristic towering header from Aritz Aduriz 13 minutes from time in a 1-1 draw at home to Villarreal. Manu Trigueros was the hero and villain for the visitors as his penalty was saved by Spanish international Kepa Arrizabalaga before he made amends to fire Villarreal in front from the edge of the box.